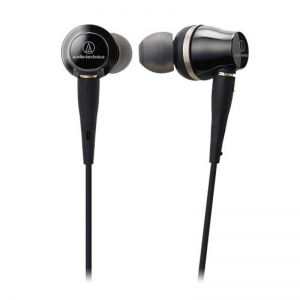 Audio-Technica is one of Japan’s world-renowned audio equipment manufacturers. Numerous fans across the globe marvel at the company’s creations and some people would often show their love by shortening the brand’s name to “Autech.” The features and specifications of each product coming from this manufacturer differ from each other. There is audio equipment with cheap prices that offer reasonable performance and some that emphasize power in the lows. This time we’re going to introduce our top recommended Audio-Technica earphones to buy in the Philippines in a ranking format. We’ve compared the products we’ve chosen by means of performance, price, and online reviews, just to name a few. Don’t forget to consult our guide to help choose the best Audio-Technica earphones for your personal needs. 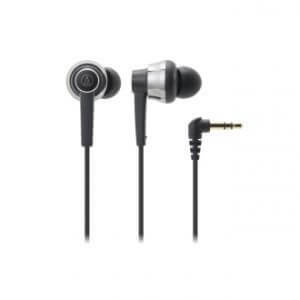 Start your search for the best Audio-Technica earphone by looking at the product’s name. Take a look at the earphone’s model number as it tends to start with the “ATH” initials. In fact, you’ll immediately know that the product comes from this manufacturer because of those three letters. 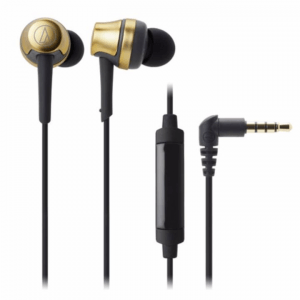 Let’s take a look at some of the earphone series made by Audio-Technica to let you acquire a better grasp on what the company has to offer. 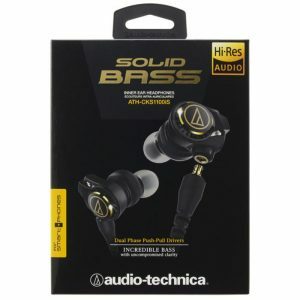 Product in this series tends to have a code like “ATH – CKS000.” The “S” in “CKS” refers to solid bass, which means that earphones in this product line will provide deeper bass than other similar items from the same manufacturer. 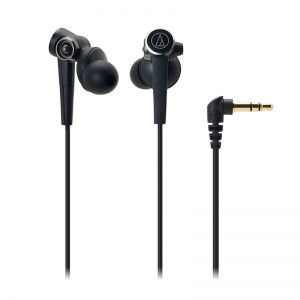 Audio-Technica CKS earphones are recommended for people who are into rock, hip-hop, and EDM. Also, people who keep a fit lifestyle while listening to their favorite music will find the deep bass signatures from the CKS line to help with their workout sessions. Audio-Technica earphones that come in this lineup tends to have a product code like “ATH – CKR000.” The “R” in “CKR” represents three things: resolution, response, and reality. In other words, CKR earphones can deliver high-resolution audio at a high response rate with an excellent reproduction of the original sound. People who are into jazz and classical music will get a kick out of the earphones in this series. E series Audio-Technica earphones tend to come with a product code like “ATH-E00.” There are older models in the line but they’re represented with the “IM” initials instead of an “E.” Hence, you might find product codes like “ATH-IM00,” but they’re still technically within the same series. Even though these earphones are great for listening to different types of music, it does make an emphasis on being an excellent choice for professional monitoring. It can deliver professional sounds with a “what you hear is what you get” experience. If you want to “feel” the sound coming from each instrument played from your favorite tracks, then earphones in the E series are your best bet. It can even give you the feeling that you’re experiencing a live performance. Now, let’s take a look at the top 10 best earphones of Audio-Technica that you can get from the Philippine market. 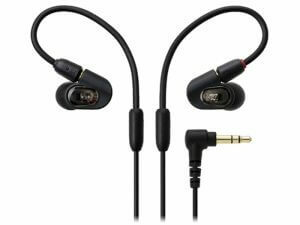 Many earphones that carry this brand offer a reasonable price tag to easily accommodate different audiophiles. You can always refer to this list if you’re out on the market looking for the best Audio-Technica earphones. While there are earphones on the market that offer great audio but come with an expensive price tag, this model will happily give you excellent sounds at a budget-friendly price. There’s a definite “punch” to the bass thanks to its 14-millimeter driver despite being in the CKR series. However, it feels like you’re listening in a compressed room because it doesn’t offer a large dynamic range. Nonetheless, it’s a good choice for people looking to upgrade from the standard earphones that come with your smartphone but without spending too much money. If you want to get proper noise isolation from earphones, then you might have to spend more than ₱5,000 to experience the feature, but this product will give you that functionality at a reasonable price point. It comes with a Bass Venting System that gives an extra “oomph” to the lows while giving a decent amount of noise isolation in return. Fans of deep bass audio profiles will get a kick out of this model, and the lows don’t even overshadow the rest of the audio spectrum. Other ATH-CKS earphones emphasize on giving solid bass performances, this model highlights high-resolution sound reproduction. It’s thanks to the pair of 12.5-millimeter push-pull drivers that offer a wide-range audio production while still giving plenty of deep bass response. Its 1.2-meter cable with inline mic and control is detachable, which means you can easily repair it by changing the cable even if it is broken. If you’re a fan of EDM, hip-hop, or rock, then this can become the best bass-powered earphones to get with its high-resolution sound. Like many earphones on the market, this model comes with a set of silicone ear tips to help fit different ear canal sizes. However, some might find the design to be uncomfortable even people with large ears because the shells will stick out a bit. If you don’t mind the design and you still want to fulfill your bass-filled fantasies, then these are the earphones for you. 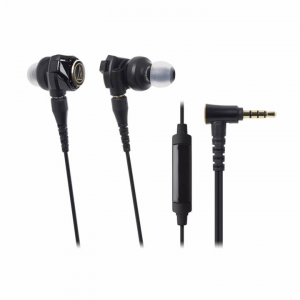 The earphones present a full bass performance with a deep emphasis on the mid and sub-bass profiles. As a result, music comes out sounding “thick,” but the vocals are still clear. Audiophiles looking for a flat and neutral response from their Audio-Technica earphones should look into this model. 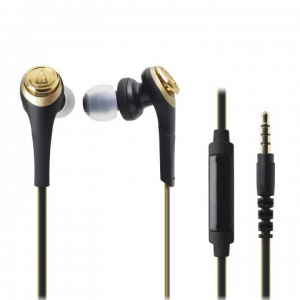 It has machined brass stabilizers (which are absent in many earphones on the market) that absorb any unwanted vibration to deliver clear-sounding mids and highs. One caveat for these earphones is its in-line mic and audio controller because it can only let you pause, play, and restart the music. You have to control your tracks and volume of the sound from the source device instead of using the in-line mic. That’s being said, it gives much more convenience for users compared to other models without an in-line mic. These earphones are an upgraded version of the CKR30IS, which means it has just about everything good about its sibling and made it better. For one thing, it now boosts the bass response thanks to a 12.5-millimeter driver. However, the upgrade in features and performance does come with a slight bump in price. If you don’t have the CKR30IS yet, and you want a touch of bass to your favorite music tracks, then these earphones are for you. 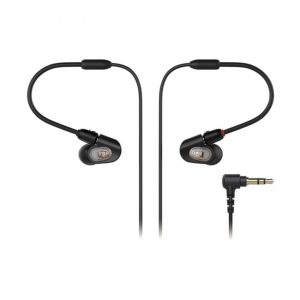 You can usually find headsets that offer excellent soundstages on the market, but these earphones can offer a similar performance because of its dual chamber design. The audio coming out of it makes you feel like you’re listening in a medium-sized room instead of a compressed area. However, the fit might not be as impressive as other earphones because the earphones can still jiggle around your ear even when you’re just doing light exercises. Nonetheless, if you’re a fan of rich bass signatures and a great soundstage in a small package, this model is a great pick. Sometimes it’s difficult to catch the lyrics when listening to music using cheaply-made earphones, but this model lets you hear the vocals in your favorite tracks with great clarity. It can bring out clear and crisp vocals with the help of its aluminum stabilizer to offer linear diaphragm movement. However, the performance in the mids is slightly “colored” and that might disappoint some people looking for a flat audio response. 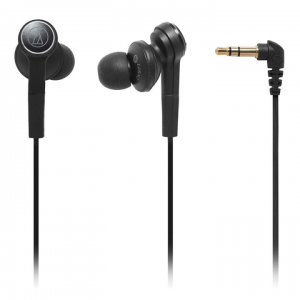 Still, the treble performance is top-notch since you won’t find any peaking or shrilling while listening to music. 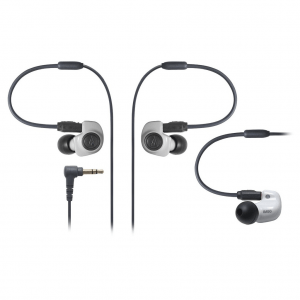 Thanks to its dual-symphonic driver, it can clearly produce a wide range of sound frequency compared to other earphones in the same price range. It won’t give a dynamic bass sound like “CKS” series, but you can enjoy many genres of music with this earphone. The most notable point of this earphone is its shape. 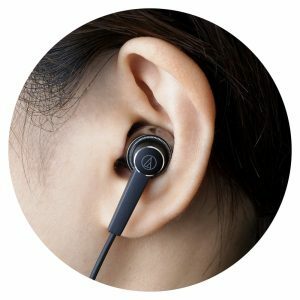 You can wear it by wrapping the earphone cord over the top and down the back of the ear. If you are a fitness lover and wish to enjoy listening to your favorite music clearly, this will be the best earphone because it comfortably stays in your ear canal even when you are doing exercise. These earphones do have an expensive price tag as compared to many other Audio-Technica earphones, but you’re definitely going to get your money’s worth from it. A single balanced armature driver presents an accurate and full-range flat response which is perfect for audiophiles looking for an excellent reproduction of their favorite tracks. Sound performance dictates that there is still a slight “punch” to the bass but it’s not going to destroy the entire audio experience. Heavily consider getting this model if you like to play different genres of music. 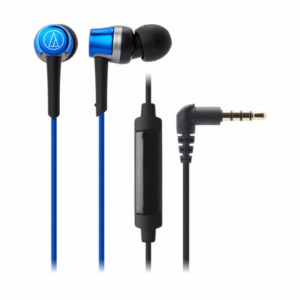 What did you think of our list of recommended Audio-Technica earphones? You should also choose by looking at the design, fit, and, of course, the overall audio performance. Choose the right pair of earphones and you’ll find yourself lost in an auditory bliss.